Despite agreeing to a two-year compliance period, thermal plants ignored a December 7, 2017, deadline and a 2015 law to clean up. New Delhi: Over five years to 2017, thermal power plants – among India’s chief polluters – pushed nationwide levels of sulphur dioxide (SO2), a toxic gas, by 32% and fine particles called PM 2.5 by 34%. Despite agreeing to a two-year compliance period, these plants ignored a December 7, 2017, deadline and a 2015 law promulgated by the environment ministry to clean up. Now the same ministry is arguing that so many power plants cannot go offline and is urging the Supreme Court, which will hear the case on February 1, 2018, to push the deadline to 2022. If the power industry had implemented the new norms, emissions from thermal power plants could have fallen by 70-85%, said a 2017 brief released by a group of citizens, volunteers, and activists from non-profits Greenpeace India, Help Delhi Breathe, My Right to Breathe, Jhatkaa, The Climate Agenda and URJA. More than 300 thermal plants nationwide were to install scrubbers and filters after the environment ministry notified new air pollution regulations in December 2015 under the Environment Protection Act, 2015. 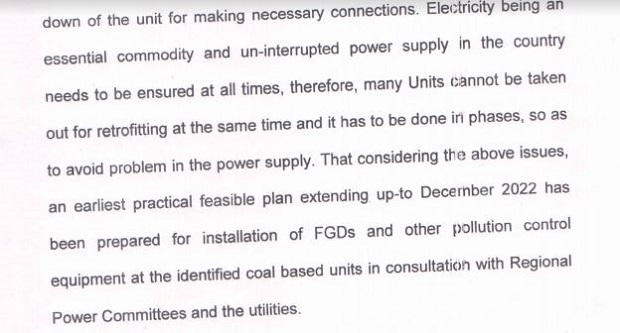 A government affidavit filed before the Supreme Court in November 2017 argued that all units could not be taken offline to retrofit equipment because power supply from thermal plants – which supply 80% of India’s electricity – could not be interrupted. “… An (sic) earliest practical feasible plan extending up to December 2022 has been prepared,” the affidavit said. The 2015 rules aimed at reducing toxic emissions of SO2, NOx, PM 2.5 and mercury. PM 2.5 – and its larger cousin, PM 10 – are tiny airborne particles that can enter human lungs and sicken or kill people. NOx can cause respiratory infections and SO2 can lead to bronchoconstriction. PM 2.5 pollution caused more than 500,000 premature deaths in India in 2015, according to a October 2017 report in the Lancet, a medical journal. The study estimated 1.9 million deaths across 21 Asian countries in 2015; one in every four deaths was in India. Emissions from thermal power plants are among the biggest contributors to surging particulate matter levels in India, according to a 2016 report from Greenpeace India, an advocacy. The report identified air-pollution hotspots in India visibly linked to thermal power plants clusters. An updated 2017 Greenpeace study used satellite data to calculate the 32% rise in SO2 level and 34% rise in PM 2.5 levels, to which we earlier alluded. Pollution from thermal, or coal-fired, power plants killed about 115,000 Indians and caused an economic loss of $4.6 billion (Rs 29,500 crore), according to the 2017 Economic Survey. These figures are based on 2012 data; India’s coal capacity has grown by more than 150% since, so the impact to life, health and the economy will keep rising unless held in check, said Nandikesh Sivalingam, climate and energy campaigner at Greenpeace India. 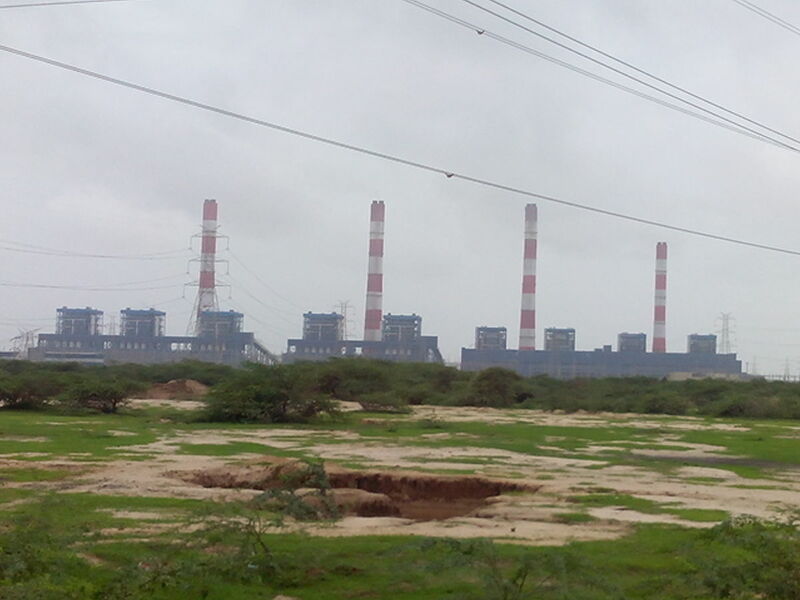 A series of right to information (RTI) applications filed by Jhatkaa, an advocacy, revealed that thermal power plants did very little over the two years granted to check their emissions. Of the 90 plants that received Jhatkaa’s RTI queries, no more than 17 responded. These replies show that most of these plants had technologies that could scrub particulate matter, but almost none of them could control SO2 and NOx emissions. Under the 2015 rules, thermal power plants were supposed to install three pieces of technology: Electrostatic precipitators (ESPs) to curb particulate matter, flue gas desulphurisation (FGD) to minimise SO2 and mercury, and selective catalytic converters (SCRs) and selective non-catalytic converters (SNCRs) to reduce NOx. The RTI replies show that most plants are still studying the feasibility of FGDs and have not installed catalytic converters. 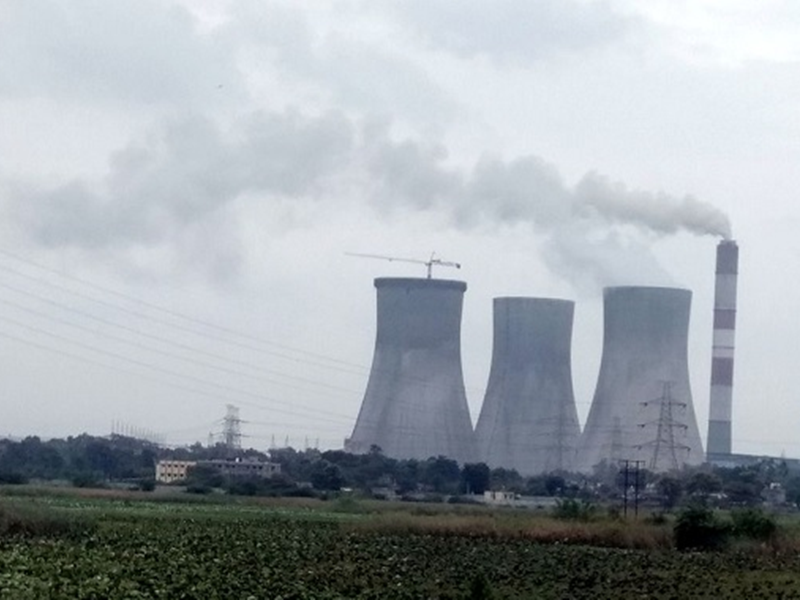 “It is disappointing to note that power plants have not taken sufficient action in the past two years and are now requesting even more time to install the necessary emission reduction technology,” Avijit Michael, executive director, Jhatkaa, said in a statement. The ministry of environment must penalise defaulters to demonstrate that it considers the health of Indians a priority, he added. In its reply to the RTI query, the National Thermal Power Corporation (NTPC) said it could not shut down its more than 20 power plants, which collectively produce almost a fourth of India’s electricity, to install catalytic converters and FGDs because that would “plunge the country into darkness”. It would cost $38 billion (Rs 2.4 lakh crore) to clean up India’s coal-fired power plants, said New Delhi-based Association of Power Producers, and electricity would become costlier. However, the Centre for Science and Environment, a think tank and advocacy, in a 2016 study estimated clean-up costs would lead to an increase of less than 3% annually in power tariffs over the next three years. Environment ministry secretary C.K. Misra recently justified the delay. The two years compliance time, which the ministry now deems as being too short, was decided after many meetings between the environment ministry, the power ministry, the power industry and the Central Pollution Control Board. The environment ministry is also fighting a case before the National Green Tribunal (NGT) against Greenpeace India campaigner Sunil Dahiya, who has alleged that the ministry is not implementing the 2015 air pollution rules. Bhasker Tripathi is a principal correspondent with IndiaSpend. This article originally appeared on IndiaSpend, a data-driven, public-interest journalism non-profit. Read the original article here.